One thing I’ve learned about people: we always want what we can’t have. In that regard, we love strawberries in winter. And the only way to enjoy the delicious taste of summer fruits in the winter is to freeze them. Now, I know a lot of people are reluctant to freeze fruits and veggies, thinking that they lose their freshness and taste. But that’s just not true. Strawberry season can actually last throughout the entire year, as you can keep your strawberries fresh for up to six months. It all depends on the method of freezing, and I’m going to share some methods for freezing strawberries with you. One thing to note first: strawberries are extremely sensitive fruits. They are sensitive to both cold and heat. That means you should finish the freezing process as quickly as possible. So let’s see how to freeze strawberries and enjoy them in the winter. After all, strawberries and whipped cream are great all year long. Most people prefer to freeze their strawberries whole. Count me in this group as well. When you freeze strawberries whole, you can use them in various scenarios later on. You can bake them, you can eat them fresh, and you can put them in smoothies. It’s important to note that strawberries need to be frozen individually, not altogether. Six months after freezing, you can still use strawberries frozen by this method. So, what are the steps? Let’s go! Start by washing the strawberries, and then gently dry them out. Make sure not to soak the strawberries in water for a long time, as it will make it almost impossible to dry them. In addition, strawberries lose their taste and flavor due to soaking. The next step is to hull the strawberries. Remove any spoiled strawberries (you can save them for another method—watch below). Place all strawberries on a baking sheet, making sure they don’t touch each other. Freeze until they are solid. 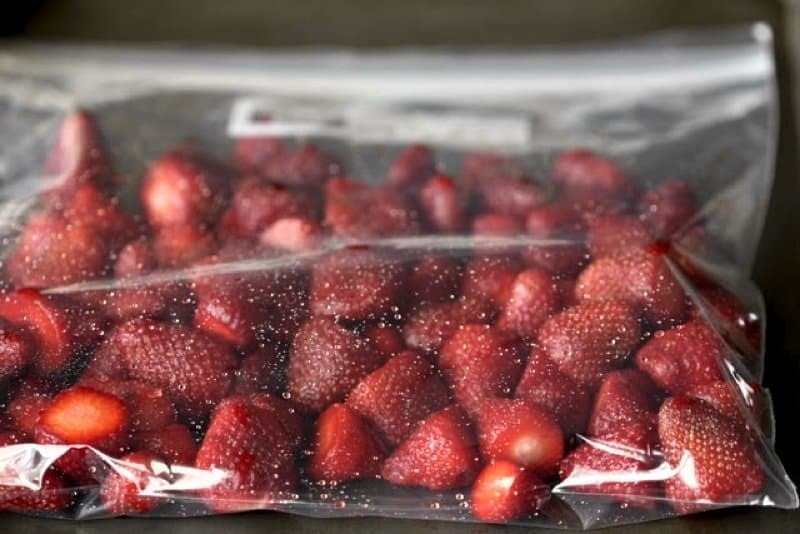 Transfer the strawberries to a plastic bag or any airtight container and store in the freezer. Make sure to label your plastic bags with contents and date. This will help you remember how long you can use them. Another method for freezing strawberries is by making a syrup. This is an old-school method that’s been passed down from one generation to another. When you use this method, you get a standalone, delicious dessert, as the berries retain their color and shape. A few things to note. Prepare the syrup before you pick up the strawberries. You can even keep it in the fridge for a week or two. This way, the syrup will be chilled and ready for your berries. Another thing: if you want a more delicate scent and flavor, add a touch of orange zest, vanilla bean, or even a green cardamom pod. These flavor enhancements will make your jar of strawberries a delicate dessert come winter months. Start by combining four cups of water and one cup of sugar. Dissolve the sugar in the water. If you use hot water, make sure to chill the syrup before adding the strawberries. Add the strawberries to a container (you can use whole or sliced berries). Cover with ½ cup of syrup per container. Package and freeze. When it comes to fun ways to freeze berries, ice cubes are one of my favorites. You can use this method for any time of the year, not just the winter. You’ll need some ice cube trays, of course. Wash the strawberries, and then let them dry out thoroughly. Place the strawberries in blender and blend until smooth. Add one teaspoon of lemon juice for extra flavor. Pour into ice cube trays, and then place in the freezer. When you want to use them, pop the strawberry cubes and place in a drink for summer freshness. Or use in a smoothie. Freezing strawberries, or any fruit for that matter, is always fun to do. And when you think of summer, popsicles are probably one of the first things that come to mind. Wash and dry out strawberries. Remove the tops. Put the strawberries in a blender and blend until smooth. You can add lemon juice or orange juice for extra flavor. Pour into popsicle trays and cover them with plastic wrap. Poke a popsicle stick through the wrap of each one. Freeze. Enjoy your popsicles any time! I said at the beginning that even overripe strawberries can be frozen and used. And coulis is a perfect result. Believe me, strawberry coulis is well worth the effort, and you’ll have invested just little of your time. Wash and hull the strawberries. Combine all ingredients in a blender. Pulse until your berries are chopped. You can now switch to blend, and blend until smooth. Taste it, and if you like, add more sugar. You can also pass it through a fine sieve to remove any seeds from the purée. Pour into two one-pint jars. Fill the jars up to ½-inch from the top. Freeze. You can defrost it at any time, or you can even store the sauce in the fridge for four days. Wash the berries, let them dry out, and then cut them in halves or in slices. Put into a bowl. Sprinkle ½ cup sugar over one quarter of the strawberries. Repeat for the remainder. Stir gently, and allow the sugar to dissolve. Be sure to be gentle and careful when stirring, as you don’t want to bruise your strawberries. Pack the strawberries into a freezer container, seal it and freeze. Harvest berries early in the morning to get peak flavor (this applies mostly when the weather is hot). Make sure to harvest berries at their peak maturity. Don’t harvest overripe and mushy berries. Freeze your berries after harvesting. Don’t wait for days to freeze them, as they will lose flavor, taste and nutrients. Remove as much air from the plastic freezer bags as possible. The more air you remove, the easier it is to freeze the berries (and they’ll last longer). Seal the plastic bags thoroughly to prevent freezer burn. To reduce the freezing time, cut the strawberries into smaller, bite-sized pieces. The strawberries have to be dry before freezing. If they’re not dry, the water will freeze on them and they won’t taste good.